592 pages | 7 Color Illus. | 145 B/W Illus. In Calabria, Italy, where bergamot has been successfully cultivated since the eighteenth century, it is commonly defined as "the prince of the Citrus genus." Written by an international panel of experts from multiple disciplines, Citrus bergamia: Bergamot and its Derivatives represents the most complete treatise on bergamot and its derivatives currently available. Although production of bergamot and its derivatives is comparatively small, its chemical composition and biological properties have been of great scientific interest and the oil is considered essential in many high-quality perfumes. There is also an increased demand for bergamot oil for food flavorings and gastronomy. A tribute to bergamot, Citrus bergamia: Bergamot and its Derivatives covers all aspects of bergamot, from its historical and botanical origins, cultural practices, and transformation technologies to the use of its derivatives, possible contaminations, and biological activity. 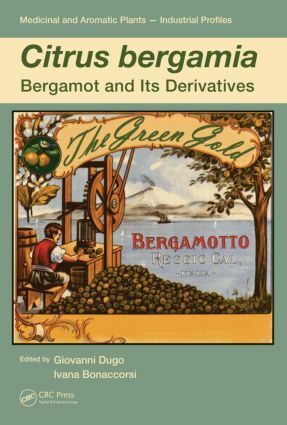 The book examines the chemical composition of bergamot in peel oils, leaf oils, juice, and fruits, extracted by various techniques—mechanical, distillation, and by supercritical fluids. It covers newly identified classes of compounds, limonoids and statins, describing the identification and assay of natural statins and the pharmacological activities of limonoids. It also discusses bergapten properties and its uses in cosmetics and medicine, as well as the use of bergamot in perfumery and in foods and beverages. The book concludes with a chapter reviewing the available data and global legislative status of bergamot as they relate to the safe use and trade of bergamot products. Professor Giovanni Dugo, Ph.D., recently retired from his position as a full professor of Food Chemistry at the University of Messina, Italy. Dugo’s scientific activity is focused on the development of innovative analytical methods and the study of food matrices using innovative methodologies. This includes method validation using pure standard compounds and complex food samples and exploitation of the developed methods for the study of food matrices: essential oils, fruit juices of citrus and noncitrus origin, food lipids, wines, coffee, cheese, and vegetable products. Dugo’s research is reported in 350 national and international papers, approximately the same number of communications at national and international symposia, and several chapters in scientific books and encyclopedias. He is also the editor of books dedicated to the chemistry and technology of citrus products and one on food toxicology. Dr. Ivana Lidia Bonaccorsi has been an assistant professor of food chemistry at the University of Messina, Italy, since 1998. She has taught numerous courses at the University of Messina, such as formulation of cosmetics, food chemistry, functional foods, biotechnology in food chemistry, and basic inorganic chemistry. Dr. Bonaccorsi’s research interests mainly focus on the determination of contaminants of citrus oils, development of advanced chromatographic and spectroscopic techniques for the analysis of real samples, assessment of genuineness parameters by GC-C-IRMS and by enantioselective separations on natural complex matrices, and development of new methods for the analyses of different food matrices by innovative chromatographic techniques. Dr. Bonaccorsi is the author of about 50 scientific papers published in national and international scientific journals. She is coauthor of numerous book chapters on the composition of citrus peel, leaves, and flower oils.